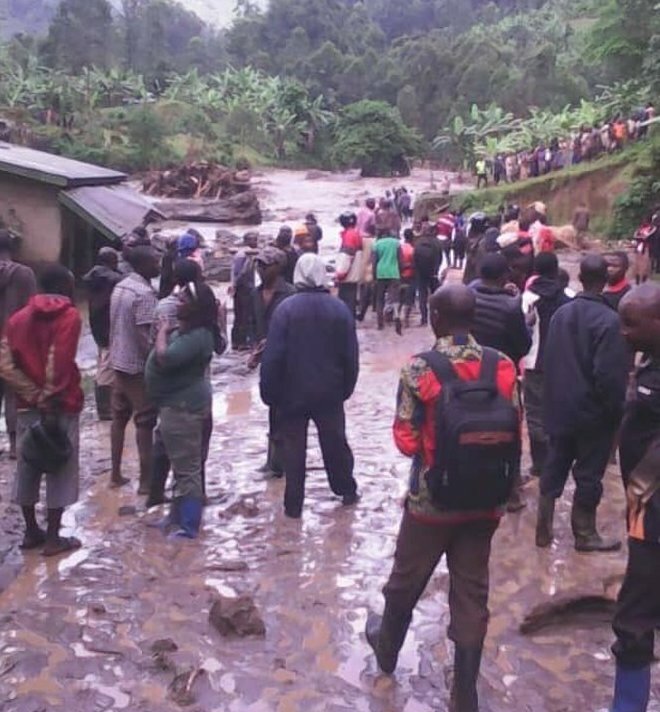 BUDUDA – Authorities in Bududa district are digging through heaps of mud along river Manafwa in search of survivors and bodies after a landslide swept through an entire village killing more than 70 people on Thursday. The landslide that was triggered off by a heavy downpour from 1.00pm to 3 pm began in the Mt Elgon National Park, blocked river Manafwa before burying Naposhi village in Bukalasi sub-county at the slopes of Mt Elgon. Witnesses said the landslides were unexpected, happening shortly after torrential daytime downpour that at first seemed to have done little damage. Mr Wilson Watira, the Bududa district LCV chairman told PML Daily that a local team armed with hoes, sticks dug through mounds of mud in a desperate attempt to rescue their loved ones and by 6.00pm, only 33 bodies of the dead people had been retrieved from the mud. And the search is continuing. This is almost the third time such blanket punishment by Mother Nature in the same district. In 2010, landslides flattened villages in Nametsi Parish, burying an estimated 350 residents. And where tragedy struck yesterday is close and adjacent to Nametsi. Many survivors whose houses had been swept were reported stranded on one of the high-risk villages’ cut-off by River Manafwa that burst its banks in Bukalasi sub-county. “This mudslide came after heavy rains pouring in the forest that triggered off mudslides and floods at River Manafwa and the waters is still too much, we can’t cross the other side because even bridges have been swept,” said Mr Watira October 11. He revealed that Tsume junior primary school is also swept through and that pupils will not access their school for lessons because the river bust its banks and went through the school. “The entire Naposhi village blocked by a huge mass of soil, the river is flooded houses have been swept and bridges have been swept that you can’t cross the other side to make a search,” said Mr. Watira. The assistant CAO Mr Sam Nasambwa said many people have been killed and livelihood destroyed adding that the ground is very soggy, the soils seem to be slumping and the depth definitely has grown. “We need help, we need food, we need shelter and other essential items to breathe life in the survivors,” said Mr Nasambwa. 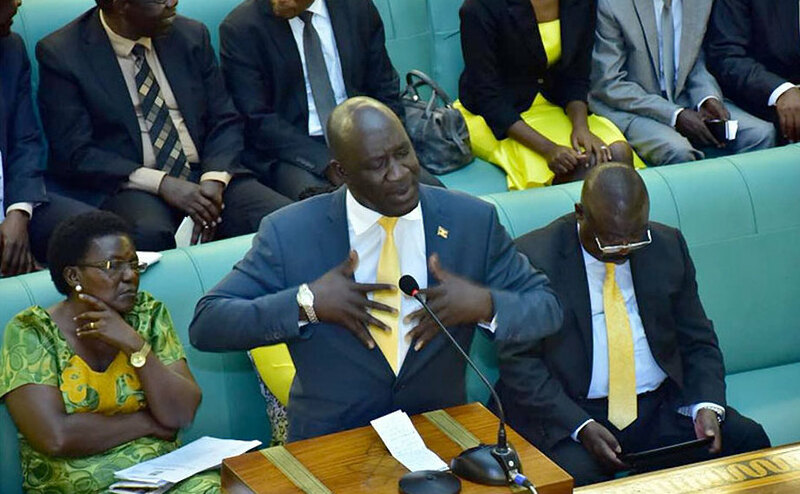 The state minister for disaster preparedness Mr. Musa Ecweru said it was still too early to say how many had been killed in Thursday afternoon’s landslides, but officials from Bududa said the final death toll would probably above 100. “We shall send rescue teams there to find out how many have been killed and how many houses have been destroyed as for now it is difficult to estimate,” said Mr. Ecweru. Landslides are a common occurrence in the hilly parts of eastern Uganda, and they have been especially lethal over the years in those villages where the land is denuded of vegetation cover. In 2010, massive landslides in Bududa killed about 100 people, destroying buildings including the village market and a church. Blacklisted areas: The team has blacklisted Bumwalukani, Bunanyuma, Shalo, Buwali, Nametsi, Mabono, Bushiyi hills in Bududa and Kato, Butoto, Buwabwala, Bumbo, Tsekululu and Sono hills in Manafwa as the areas where the soils are still moving and where mudslides are likely to occur anytime. Past disasters: In March 2010, landslides hit Nametsi village in Bududa District killing 350 people and displacing thousands.